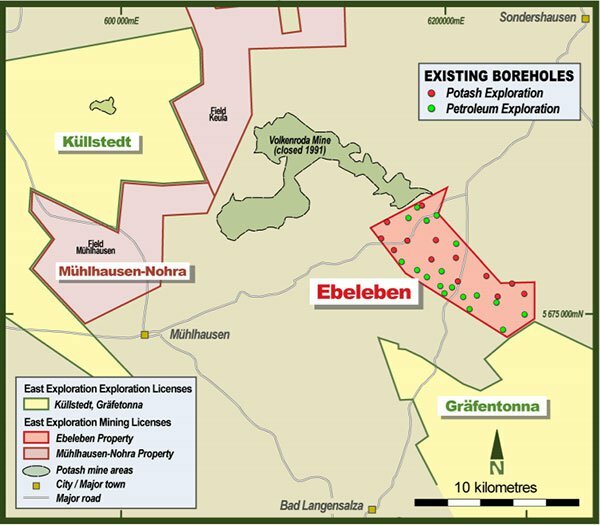 Davenport Resources (ASX:DAV) this morning announced a historic resource on its 100%-owned Ebeleben mining licence in the South Harz region of Germany. 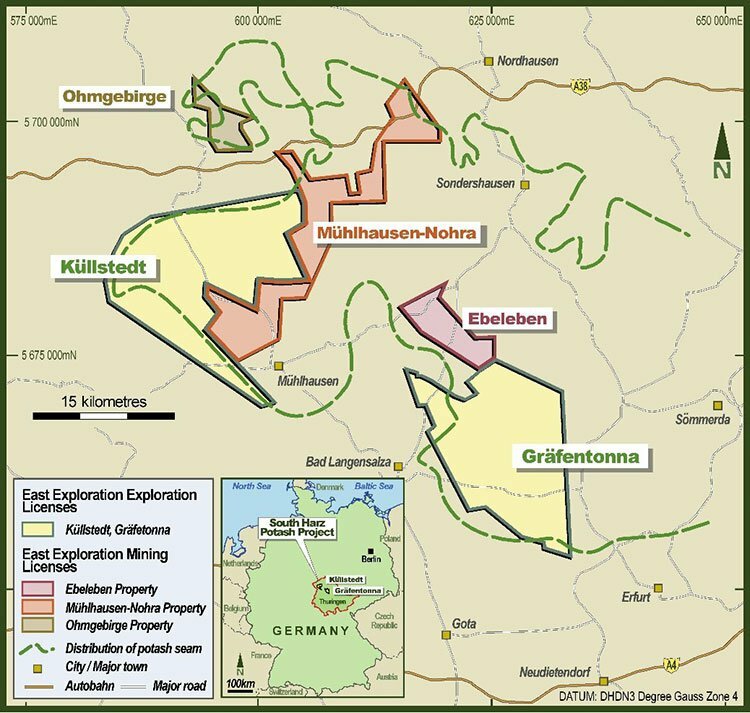 Ebeleben is one of three perpetual mining licences in the South Harz basin that DAV acquired from the German government agency Bodenverwertungs-und-verwaltungs GmbH (BVVG) recently. DAV now holds a total of more than 650 square kilometres in the South Harz. The historic resource estimate for the Ebeleben licence is 356 million tonnes of 16.1% Potassium oxide (K2O) (57.4Mt contained K2O) in Sylvinite. That’s equivalent to 91 million tonnes of potassium chloride (KCI). The company’s Managing Director Chris Bain explained that DAV anticipates that a minimum number of carefully located confirmation drill holes can readily validate these historic resources to allow conversion to JORC 2012 standard. Yet it is still early days on the project and investors should seek professional financial advice if considering this stock for their portfolio. The Ebeleben area is considered an extension of the Volkenroda Potash Mine that operated for more than 80 years to 1981. The mining licence covers a band of Sylvanite potash mineralisation that extends from the now closed Volkenroda mine to DAV’s Grafentonna exploration licence. There are 12 potash holes that were drilled in two stages in the 1960s and 1980s within the licence area. There were also 18 hydrocarbon exploration drill holes sunk within the area. This historic drilling provided a quite detailed picture of the lithostratigraphic structure and the predominantly Sylvanite minerology. Geological and hydrological conditions were considered to be largely similar to those in the adjacent Volkenroda mine and the potash salts were considered processable with the technology then in use at Volkenroda. 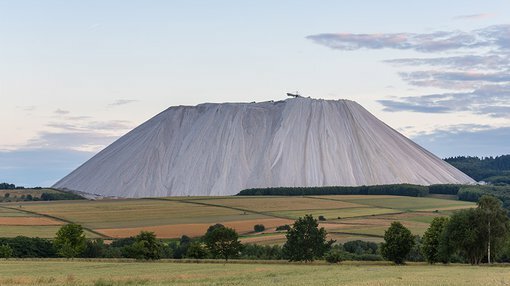 The detailed information supporting the historic resource estimate announced today will allow DAV to fast track cost-effective brownfields evaluation of the area with the aim of reinvigorating the South Harz as a globally significant potash producing region. To upgrade the Ebeleben historic resource to JORC 2012 standard DAV plans to do confirmatory drilling by twinning one or two of the 12 historic drill holes drilled specifically for Potash. Further historic resources on the other mining licences acquired from BVVG will be released as the data is reviewed. Once all data has been evaluated DAV intends to select priority areas with historic resources for drill testing. Areas will be prioritised based on the quality of the historic results and on available access and approval requirements for new drilling.